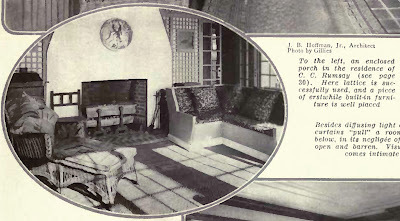 A spread from House & Garden on the Charles Cary Rumsey estate designed by F. Burrall Hoffman Jr. c. 1910 in Brookville. Click HERE for more on the Rumsey estate. Labels: Brookville, F. Burrall Hoffman Jr.
LOL, Zach, once again we're in some sort of cosmic sync on our posting subjects-as it happens, I did a post today about Vizcaya, also designed by Hoffman, but, get this, posted a picture of a fountain in the garden, with spouting frogs sculpted by, you guessed it, Charles Cary Rumsey. Based on the exterior photos and floor plan included with your previous post, I felt the Living Room seemed like an afterthought. 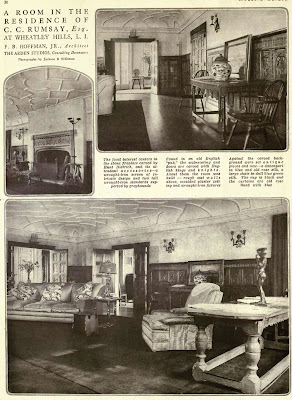 It's as if the original living room was reconfigured into the Children's Room and Hall and the angled foyer and grand Living Room were additions created to house the wainscoting and doors "found in an old English 'pub'." As previous commenters said, the exterior seems like an odd assemblage. However, I agree with The Down East Dillettante, the interiors have an eclectic charm that is quite pleasant.